Simulated oil spill trajectories found bears in Russia would be more vulnerable—especially at two islands that provide important habitat. 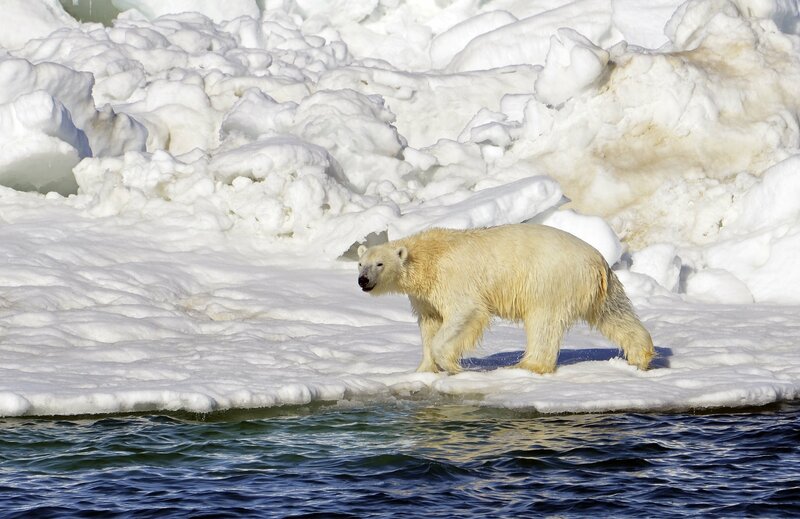 A major oil spill in the Arctic Ocean on either side of the maritime border between Russia and the United States would threaten polar bears in both countries, a new study from the U.S. Fish and Wildlife Service finds. The study simulated spill trajectories that would occur from an offshore well blowout on either side and found that either scenario oil would wash ashore in both nations. One potential blowout location would be the Alaska site of the Crackerjack well drilled in the past by Royal Dutch Shell, and another potential location would be off Russia’s Wrangel and Herald islands — important habitat for the species and a region that is a designated wildlife reserve. Results of the study were presented Thursday by Ryan Wilson, a Fish and Wildlife Service biologist, at the Alaska Marine Science Symposium in Anchorage. The analysis crunched information about ocean currents, winds, and sea ice to forecast the effects on polar bears from what would be a major oil spill in Chukchi Sea: an underwater blowout in broken ice in autumn discharging 25,000 barrels a day for 30 days, with no on-site containment system in place. That was the worst-case discharge scenario in the drilling plan submitted by Shell for its ambitious Chukchi exploration program, Wilson said. The company abandoned the program in 2015 after failing to find commercial quantities of oil, but the spill scenario was considered useful for analysis of potential effects of a future disaster if oil activity resumes. The study tracked the ways oil would travel over 76 days, and found that it would reach various onshore sites in three to five weeks. Territories in Alaska and Russia would receive oil from spills on either side of the maritime border, but the analysis found that the Russian side would be more vulnerable, and specifically the islands that are part of the Russian wildlife preserve. A surprising finding, Wilson said, was that while the models showed oil from a blowout disaster at either location would go into only 3 percent to 10 percent of high-value polar bear habitat, a fairly large percentage of the region’s polar bears would be potentially exposed to oil. A spill on the Russian side could expose nearly 40 percent of the Chukchi bear population, which totals about 2,000, while a spill on the Alaska side could expose about 30 percent of the population, he said. “If we had a very large spill like this during this worst time of year for polar bears, it could be pretty bad. But I want to stress that the likelihood of a spill of this magnitude occurring is extremely low, so the probability of this number of bears getting exposed to oil is also extremely low,” he said. The simulation established what would be an “upper limit” for spill impacts to polar bears, Wilson said. The findings could be useful for future oil spill prevention and response planning should oil drilling resume in the Chukchi, he said. “What this does show is that If we have a really big spill out there, trying to help polar bears by going out a there and decontaminating them is probably not going to happen,” he said, citing the sheer numbers of bears and the logistical challenges of getting to them. “It goes to show the need for early cleanup or making sure that oil doesn’t ever reach the bears,” he said. Future research could also look into the question of whether polar bears are attracted to or avoid spilled oil and whether their prey could be contaminated, Wilson said.